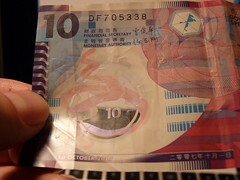 My hands on look of the new (Nov 2011) $100 polymer bank note and money laundering experiment. 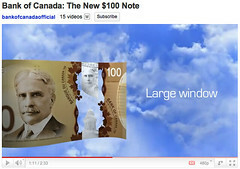 And a full b-roll commentary of the $100 bank notes. Update Nov 16th: Just checked with Bank of Canada and got some clarifications. 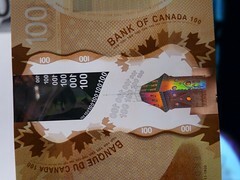 It will take BoC a few weeks to get the polymer $100 notes to different cities and local bank branches. And once the banks have the new $100, they will start removing the old $100 notes from circulation. 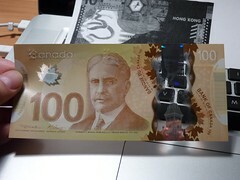 Meaning if you deposit an old $100, it will be shipped back to Bank of Canada to be destroyed. 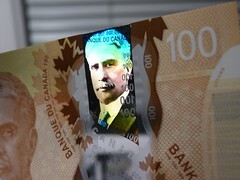 Audio and video Webcasts of the official ceremony to issue the new $100 polymer bank note will be available at 13:00 (Eastern Time). Have a read of my previous articles here and here. 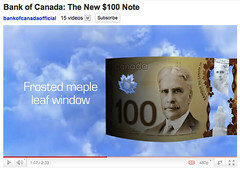 Canada New Polymer $100 Notes in Nov 2011 – Now your money is smooth & will bounce! 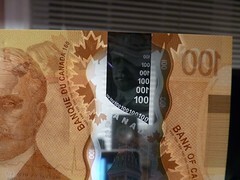 After some waiting, I am very excited to learn that the new $100 polymer bank notes will begin circulation in November 2011 in Canada. And they look great and cool too! 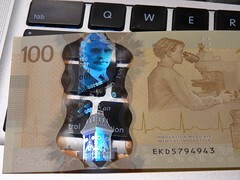 I’ve been waiting for the polymer notes since March 2011 when I wrote, “Secrets of Bank of Canada’s new plastic money: An advance look of 12 possible security features” and “Bank of Canada’s new polymer banknote – Patents & technologies by Securency International“. 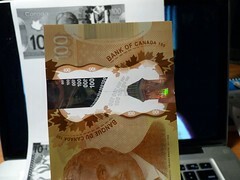 Now, I have to see how many of the security features are loaded into the $100 bills, the highest value bank notes in Canada. Not surprisingly, I expected the $100 to have the most security features. Yes, $100 bank notes will have everything and the kitchen sink. Note: This article is being updated for today and the next few days, so please check back for further general and technical coverage. 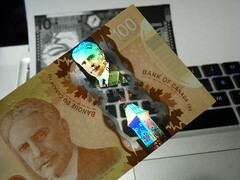 Here is a video of my first impression (on20110620) of the Bank of Canada’s new polymer $100 notes. For example, as I wrote in “An advance look of 12 possible security features” in March 2011, I speculated the use of LATITUDE™, which I think can now be confirmed in the 1:25 mark of the Bank of Canada video. 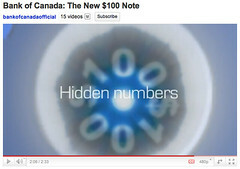 Further comments, with time codes, of the official video “Bank of Canada: The New $100 Note“. P.S. See my March 2011 article, “Secrets of Bank of Canada’s new plastic money: An advance look of 12 possible security features“. See official Bank of Canada webcast of the launch announcement. See also TorStar report, “Coming soon: money you can launder“.